When you are not overweight, yet disappointingly you have fatty bulges that you have inherited, then liposuction produces a normal curve. Conventional mechanical liposuction with tumescence using a suction force with a canula. 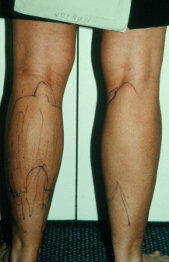 Medial thighs, upper arms – areas of “soft” fat. Ultrasonic Liposuction with tumescence: sound waves disrupt the fat cells, then fat removed by suction force for areas of “tough” fat. Backs, lumbar rolls, all re-do areas, loins. Fat is either white fat or brown fat. White fat is from overeating either external (under the skin) or internal within the abdomen and chest cavities. Brown fat is genetic/inherited, born with it and increases with age. Frequently there is a combination of both. Brown fat is removed by liposuction, white fat is lost through dieting or gastric banding. Face – Fat Collects in the jowls and naso-Iabial folds in ageing and is removed in face-lifting procedure. 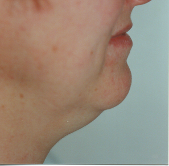 Inherited fat cheeks (buccal fat pads), advice is not to remove to produce hollowing. In ageing, fat is mainly lost in face and is replaced by the procedure of lipostructure. 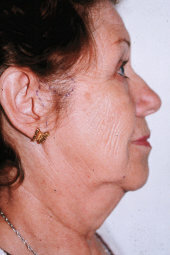 Neck – Fat in the neck may be localised just under chin or around the whole neck. Generalised Collection – Small incisions at base of ear and under chin performed under GA. In the young all loose skin will take up, while in older patients the new laser liposuction will produce excellent skin retraction, or excess skin removed with a face lift procedure. Everyone wants thin, sculptured muscular arms: the problem is either a) fatty arms/shoulders with firm elastic skin, normal contour or b) fatty arms with loose skin hanging down – ie bat wings – abnormal contour. Buffalo Hump – A round prominent collection of fat over the back of the lower neck. Very distressing and unsightly, unable to be concealed. Female Breasts – In breast reduction, no liposuction to breast, just the fatty folds lateral, below and central to breasts to improve results. Breast reduction with liposuction to lateral chest wall. 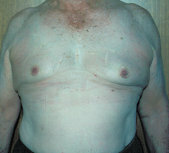 Breast reduction with flat lateral chest wall. Male Breasts – Gynaecomastia in the older patients is fat only and liposuction is required. No glandular tissue is present. Good improvement in contour, however, some loose skin may remain. Fatty breasts embarrassment, would not take off his shirt – overweight. Normal Contour for his frame: delighted with results – 550 gms fat removed either side. Front: abdominal protrusion due to excessive fat hidden under a dress but not a flat, taut tummy in jeans. Normal weight patient: The patient can be a normal weight and still develop these fat collections early in life (familial) and later due to ageing/hormonal imbalance around menopause. Metabolic syndrome is another cause. This is brown fat and liposuction is required. This patient has a small collection of brown fat concentrically around abdomen. 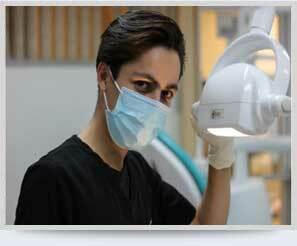 Brown fat collections are removed to a thickness of 1cm to equal white fat thickness. Loins – Back of Abdomen: Loin (love handles). Genetic (inherited) problem, seen in the young increasing with age. Very obvious in tight clothes. Can only be seen from the back. Brown fat central (8 cms thick) and white fat lateral (4cms thick). White fat should be 1cm thick. Extensive liposuction first procedure, debulking, then an abdominoplasty 4 months later. Back of Abdomen: Loin (love handles). Genetic (inherited) problem, seen in the young increasing with age. Very obvious in tight clothes. Can only be seen from the back. Thoracic and lumbar rolls – Very obvious in tight clothes and on sitting down. Brown fat, unable to be removed with dieting. Tough fibrous fat – ultrasonic liposuction required, deep and superficial liposuction required with excellent skin retraction to produce a smooth muscle look. Pre op. Lumbar and thoracic rolls. Medial thighs – Embarrasing, annoying, unsightly, with rubbing and irritation on walking and running. It is brown fat collection, dieting of no help, however liposuction gives excellent results. 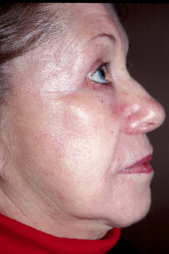 Skin retracts, is usually adequate to give a normal contour, except in older patient. Then a medial thigh reduction (French) is required. Laser liposuction ideal technique for liposuction to medial thighs. Lateral thighs – Riding breeches deformity, very obvious in jeans, inherited, excellent results with liposuction to deep fat, skin retracts well, excellent results. 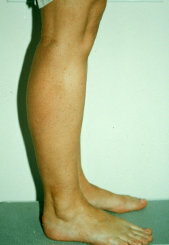 Knees – Localised fatty prominence on medial sides of knees, ugly, embarrassing very obvious in shorts. Superficial liposuction with laser lipo gives normal contour with no loose skin.